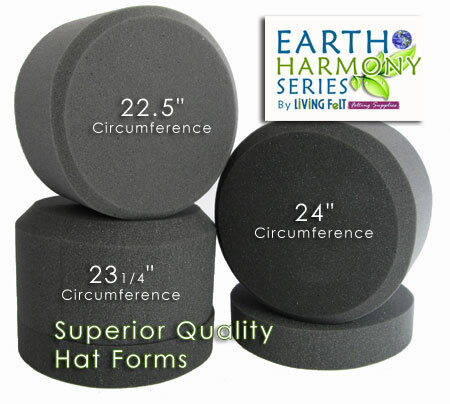 Earth Harmony Superior Quality Hat Forms! NOTE on SHIPPING: This is a bulky item and shipping requires a minimum size box. Shipping rates may be slightly higher for hat forms and brims. 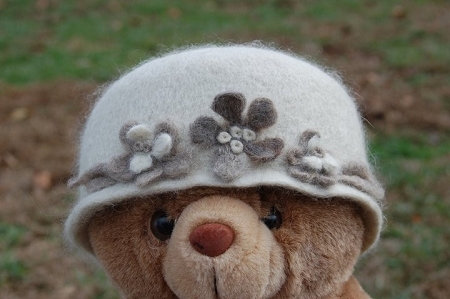 The foam hat form was originally developed by Suzanne Higgs, and this wonderful needle felting foam hat form was created using a proprietary earth friendlier foam which is part of The Living Felt Earth Harmony line of eco-conscious felting supplies, and was developed by Living Felt. You can also use it for needle felting hat or needle felting a round purse or basket like some of our pictures show! 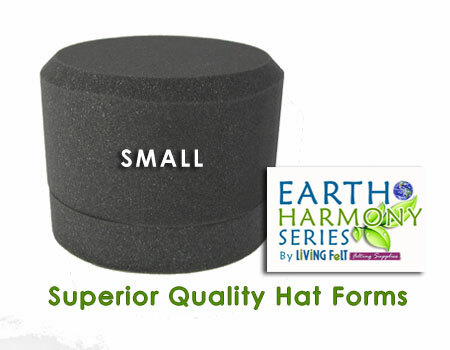 Now you can buy one size hat form and get both the tall and the short form in one hat! The hats are now cut so that you can simply attach the extender to the short crown of the hat with a felting needle or T-tack and have a tall hat form. The extender is approximately 2 inches taller. The hat making is so fun, so easy, so warming! Wet Felting Your Hat? Use this foam form as a hat block to dry your hat on! Wrap it in a plastic bag, put your newly felted hat on and shape or block as desired. OPTIONS - Get just the form or add the instructions for only $4, (a 10% savings over buying them separately) or see our Needle Felting a Hat or Vessel Kit which includes the instructions, plus YOUR CHOICE of 4 oz of wool. The "Deluxe Kit" includes the multi- needle felting tool. In short...it is made with eco-based materials which help us reduce our dependency on fossil fuels, and is a great alternative to petroleum based polyurethane foams. The eco materials include soy and other products grown by U.S. Farmers (good for them AND their families), this foam is much denser than our previous petro-based foams which gives you a nice FIRM felting surface, it's color allows it to hold up longer than white foams that tend to age in sunlight, and the manufacturing process uses less energy than traditional foams. All in All -- the Living Felt Earth Harmony Foam stacks up to wonderful needle felting results and we've lowered the price for you! (these also make great bowls and baskets! 12mo. - 3yrs 18" - 20"
Pre-Teens & Teens 20" - 22"
Adult Woman 21" - 22.5"
Adult Man 23" - 24"
In needle felting hats, they are taken off the form a number of times and tend to "stretch out" a bit". Shrinkage happens in the wet felting and fulling stages. The above information is simply a guide to help you choose the best size for your needs!